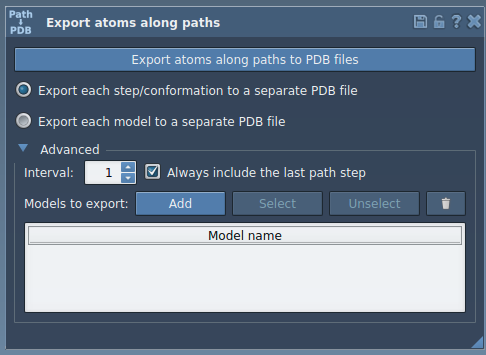 In this tutorial, we will show how to export atoms positions (for all atoms in the system or for a selection of atoms) along paths in PDB files thanks to the Export Along Paths app. This could be useful for example if you want to generate reaction coordinates for free energy calculations. Before starting the tutorial, please download the 1pv7_ligand_complex_with_paths (~13 MB) which contains files for this tutorial. Launch SAMSON. Load 1pv7_ligand_complex_with_paths.sam file provided in the archive. It will open a structural model of Lactose permease with its ligand Thiodigalactosid. 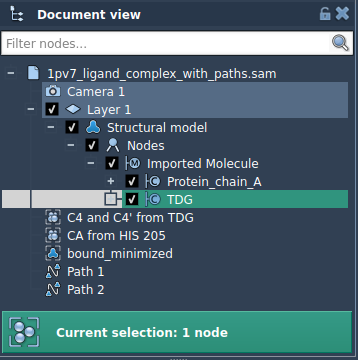 In the Document View (if you do not see it, enable it in the Window menu, or press Ctrl/Cmd⌘ + 1), you can see the protein under the name Protein_chain_A, the ligand under the name TDG, and several paths. Paths are SAMSON nodes that store trajectories of a selected group of atoms. Paths are typically created by apps. Double-clicking on a path in the document view starts / stops moving atoms along the path. For some applications, it is useful to export the coordinates of a subset of atoms along the path, for example to generate a reaction coordinate. For example, once you have computed an extraction path for a ligand (and optimized this path with e.g. the parallel nudged elastic band method), you might want to export the coordinates of the ligand along the path in order to perform free energy calculations. 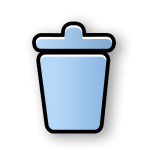 Open the Export Along Paths app by clicking on its icon . You can also find it in the App > All menu. If you want to export all atoms trajectories, just select a path (or paths) in the Document view, choose in the app how you want them to be exported (each step to a separate PDB file or all steps in one PDB file), and click the Export atoms along paths to PDB files button in the app. A window will appear asking you to provide a path and a prefix name for exported files. You can specify the interval at which path steps will be exported in the Advanced box of the app. If you want to export the coordinates of some atoms only, expand the Advanced box. Then click the Add button to add models to export. A new line in the list of models to be exported will be added. You can rename the model (i.e. the set of atoms) by double-clicking on the corresponding line in the list of models. You can add more models via the same procedure. You can see which atoms belong to a model in the model list by clicking the Select and Unselect buttons or via the context menu for the corresponding line. If you are not satisfied with the chosen set of atoms, you can reset by choosing the line and clicking the Reset ( ) button, or again via the context menu for the corresponding line. Now, you can choose how you want these sets of atoms to be exported (each step to a separate PDB file or all steps in one PDB file), select a path (or paths) in the Document view, and click the Export atoms along paths to PDB files button in the app. A window will appear asking you to provide a path and a prefix name for exported files. That’s it! You have now exported your selection.